I am a Japanese expats living in Hongkong and a member of Internations. Can I use your money transfer service to send money from Japanese bank to HSBC in Hongkong? I wlill apppreciate if you woud answer to my question. Thanks for your interest in World First. Yes, we can assist you in sending money from Japan to Hong Kong but unfortunately our JPY account is based in London. 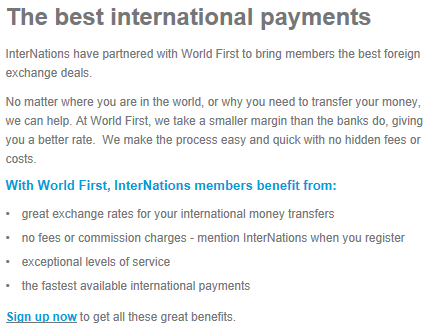 This means you would have to transfer your JPY to us in London and your bank may charge you a transfer fee to do this. We would charge you no fees however and you would still receive a better exchange rate on the exchange to HKD than if you used your bank. We do have a local HKD client account in Hong Kong so if you were sending money the other way from HK to Japan there would be no fees as you would only need to make a local transfer from your HSBC account in HK to our local account in HK. I hope this makes sense. It’s free to open an account with us and there’s no obligation to transact. You can register here and give our service a go! My American friends living in Japan are interested in your service. So Can they transfer money from USA to Japan for free?Is it right? I would appreciate if you would appreciate may answer. Yes we can assist your friends sending money from the US to Japan and as long as they mention InterNations when registering they will enjoy no fees on their transfers (subject to minimum transfer amount of US$500). We would also save you money sending funds back to the US from Japan as we would offer better exchange rates than your bank. You can all register here and mention InterNations when it asks where you heard about us. 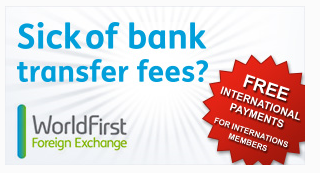 Having an account is completely free and there’s no obligation to transact with us. Once you have registered someone will be in touch to discuss your requirements in more detail.